Samaria, late 4th century BC. Silver obol. 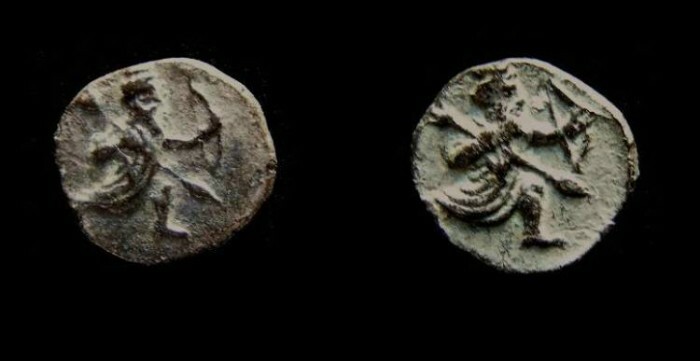 Date : These coins are normally dated to the end of the 4th century BC, but I personally believe many of them are into the 3rd century BC. Size : 9.2 x 9.5 mm. Weight : 0.67 grams. Grade : gVF, and remarkably well-centred and well-struck or such a small coin. Original dark hoard patination. Obverse : Persian style king running right, holding a bow and spear (copied from a Persian siglos or daric). Reverse : Persian style king running right, holding a bow and spear, nearly identical to the obverse.